--23 & 23a M.G. 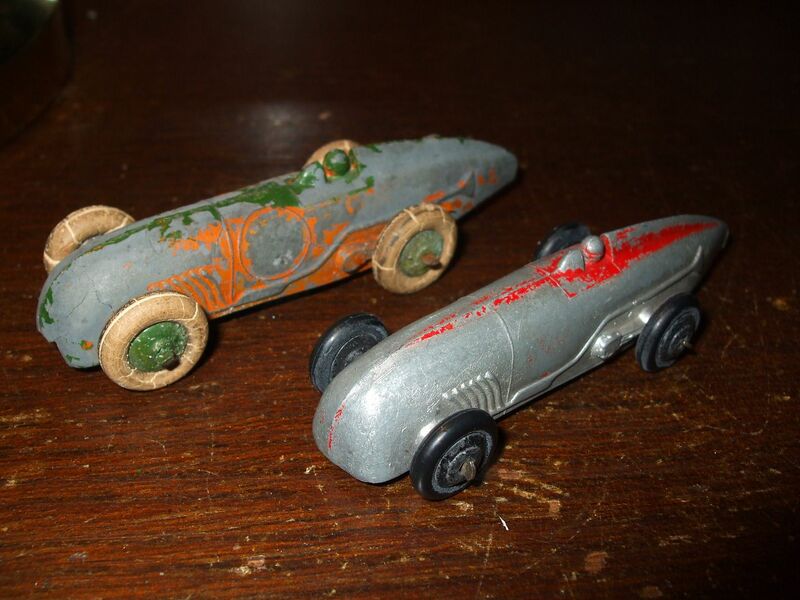 Magic racing cars. This discussion has been transfered from the thread "Displays and displaying. You write that the 23a with exhaust plus the four studs is English, can you confirm this as I think that this is a French casting. The picture you are showing is indeed from the French 23a, with both exhaust systems present. I have this model in my 23a drawer. the 23 racing car does, not the 6-folded exhaust system of the 23a. Therefore for me it represents the Magic Midget, not the Magic Magnette. Thanks form your speedy reply. I have been mistaken, I thought that your model had both the four studs and the exhaust pipes. So the second die was used already for the four cylinders ref. 23 Midget. When you have time, could you please post a large picture of this rare variation. For you, Jacques, I have always time. 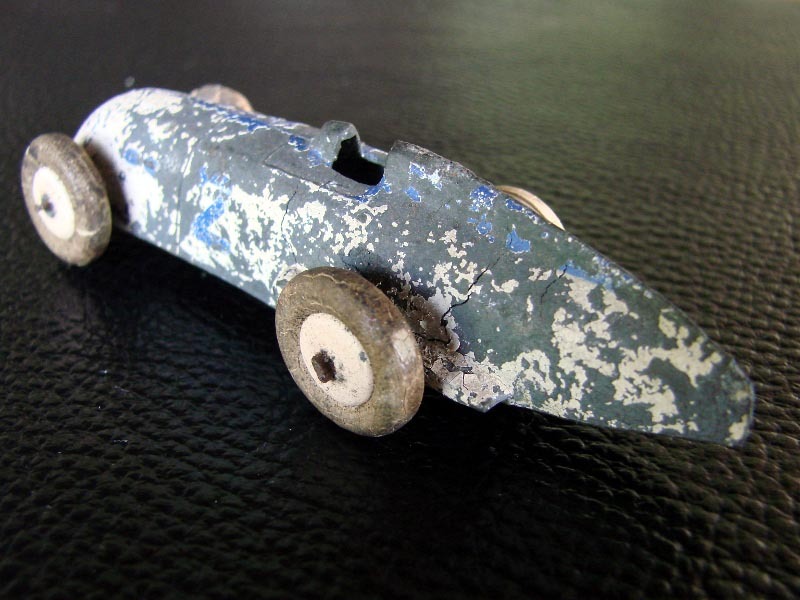 First 23a Racing Car casting with round nose, drivers head, no ribs inside. 4 exhaust stubs like on the 23 Racing Car instead of 6-branch exhaust system as normaly used for 23a Racing Car. Raised number circle on left side only. Axles crimped on one side, rounded on the other. On the time line, I would place it around end of 1934 or early 1935. For me, since it represents Eyston's first record car, the MG Magic Midget, with the 4 exhaust stubs, it's a 23 Racing Car. Others say its a 23a, because it uses the 23a casting. Then is your MG the same as this one ? By the way, to complete the set, I am looking for a picture of the No. 8 Humbug. Is there any chance that some one here can provide this pictrure ? The model is probably white with blue stripes but this needs to be confirmed. No, Jacques, this is a French 23 Racing Car. 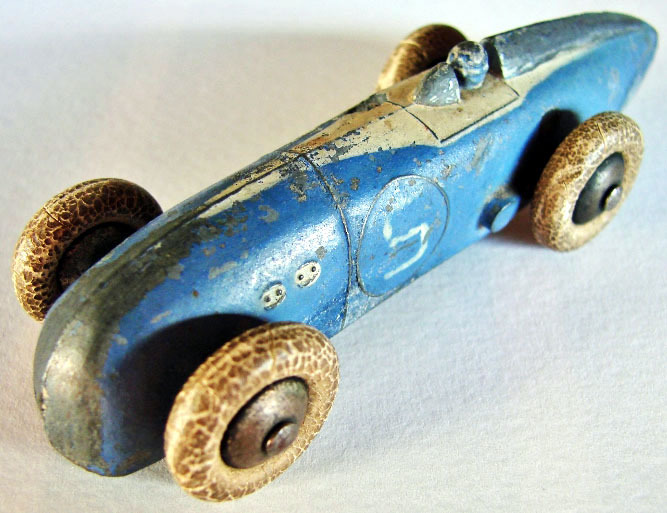 My French 23 Racing Car is white/blue, in the front row of my drawer. For a comparison, I enclose another picture which shows the difference between the French 23 in the background, with the flatter nose, and the Englisch 23 (23a?) with the rounder nose in front. By the way: are we not violating this topic by talking so much about a specific model? I am still a beginner here at DTCA and I do not want to start my activities with a mistake. You are quite right about been off topic, so I have transfered the discussion about the 23 & 23a here and deleted it from the thread Displays and displaying. The cream and green model above can not be French has Tootsietoys hubs have never been used at Bobigny. Unfortunately, I do not own this model and can not make a picture of the inside. Has to be French, Jacques. There never was a British 23 racing Car with drivers head, I believe. And the color scheme looks French too. I have a French 23a with exactly the same colors? What makes you so sure they never used Tootsie hubs at Bobigny? The racers 23 and 23a, always have Manufactured France or England inside. So easy to trace. I have some racers in my collection. Here a British 23 without pilot head and 4 stubs, smooth hubs. Has seen better days but it is a rare item. The British tradeboxes for six models have the number 23 and not 23a. Number of the box A 1002 and a separate sticker on the box indicated the racenumers on the models inside. I have two different boxes in my collection. Seems to be a zamac-issue, yours, from the damage done by metal fatigue. But I think I have one in my collection that beats it. You can literally see through it. Still, I like it, it really shows the effect of this disease. Hi John and Walter, no rarities from me as I only collect the 'ordinary' post-war versions. A nice trio below which - however - do not belong to the trade box underneath, simply because they are all of a different age. The blue one is the oldest (ca. 1946-1948), black hubs, crimped axle ends and no strut inside the tail (which the other couple do have). The one on the left has silver hubs and crimped axles, so that one is next in sequence (ca. 1950-1952). The one in the middle is the very common silver finished with red hubs and rounded axle ends (23a/220, ca. 1952-1956). Perfect, the models and the picture. Of course, the indicated years of production are my rough guess only, without any claim to be absolutely correct. Just about. The years of introduction or availability are very often tentative and the actual availability may differ by country (agent) and even shop. It is sometimes said that the no. 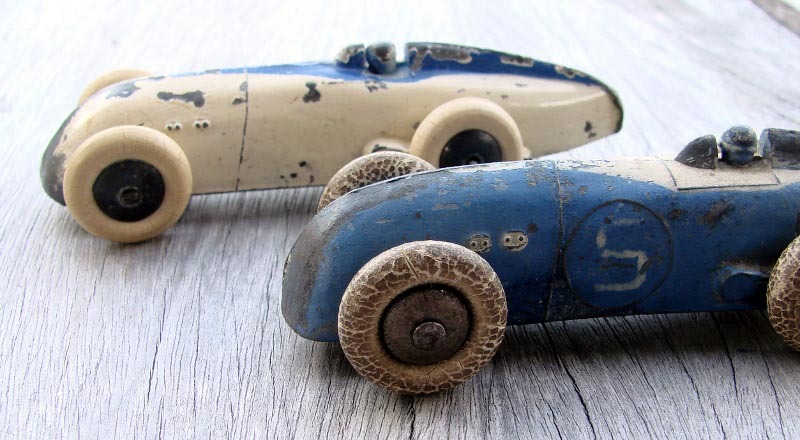 23 racers were discontinued between 1949 and 1952, but I presume the export from the UK to many countries just went on in that period, especially the ones with non-black, coloured hubs and crimped axles, but admittedly this counts not for all. My guess it's an early Fifties issue, because of the rounded axles and the silver hubs. Some more pictures of the 23 models and boxes from my collection. Here two different trade boxes for six models 23. Never seen a box with 23a number, does this exist? 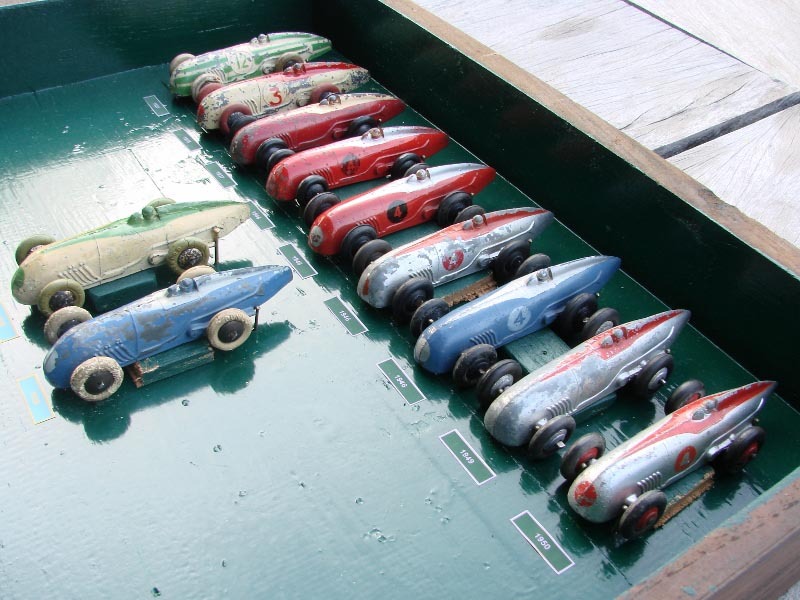 Box 23 with Liverpool pre war models. The Paris factory had their own 23 trade boxes. Some models had the racing numbers stamped at the side. Models had Dunlop tyres, sometimes matching with the color of the flash on the model. 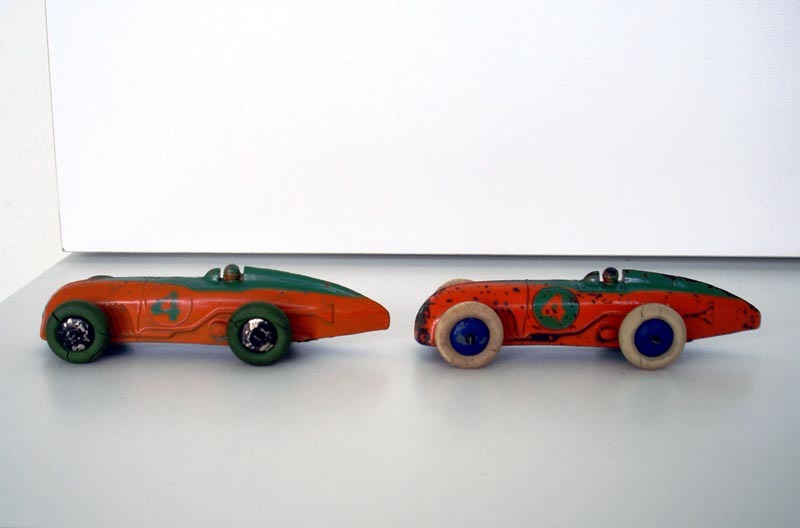 Green No 6 is a lead model with green Dunlop tyres, the other No 6 is zamak. No 3 with red tyres. Not many collectors buy German Magazines. If you are interested in a very nice article on the MG Rekordwagen from Walter, see Altes Spielzeug Nr. 2 2011. Some 23 Humbug models had coloured tyres to match the stripes. This model has nice red tyres. Thank you for posting this rare model and the second type box which by the way does not match with the model. Blue, red and green tyres are known on English 23 and 23a but not only on the Humbug as on the picture above. 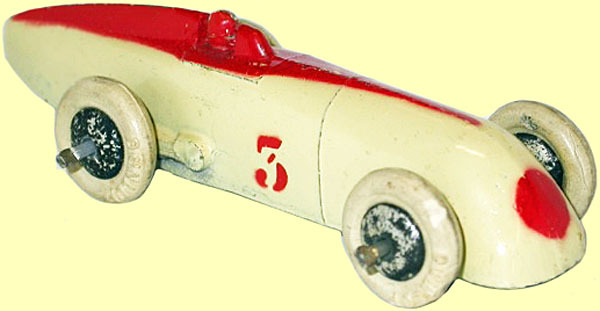 Another nice 23 Racing car Humbug. Despite it is fatigue, I admire the blue colour on this model. Hard to find in any condition. Tootsy hubs and crimped axles at one side. 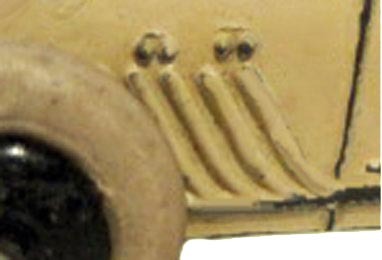 On this model original white tyres. Racing number 11 still visible. French 23a racer white with blue. White Dunlop tyres and racing number 2. An other very rare pre-war one in your collection. Well done. Could you please email me a large picture of you new old toy in the same position as the picture above. I guess some of the pictures in the Wheel variation thread should be in this thread as well. 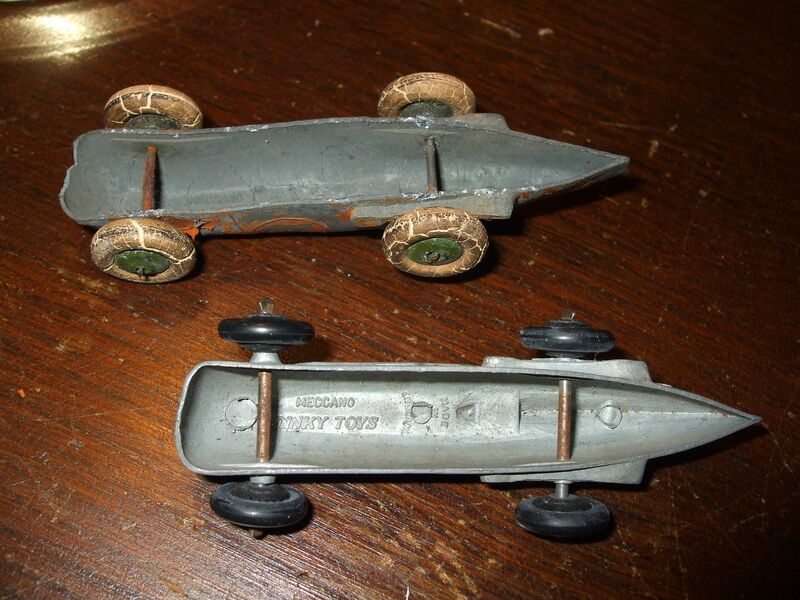 My pre war 23a Racing Cars. I really want to get a Pre War Humbug striped version if one ever turns up. In my collection a 23a model cream with red top. this model is cast in lead and has the 4 stubs exhaust. Tootsy style hubs ans the axle is round/crimped. Very unusual are the hubs, painted cream. In the Hornby Book of Trains 1934-1935 and The Meccano Book 1934-1935 is a colored picture of a blue 23a with racenumber 4. You can see that the hubs on this model are cream. It cost me a lot of years to find a model with these cream hubs. Other Dinky toys with colored hubs other then plated, blue or black have also shown up. This very early 23a must be a rare model.